The Government has announced details of a number of schemes to provide temporary emergency humanitarian support to people who have been affected by recent flooding in County Donegal in August 2017. At the request of the Government, the Irish Red Cross Society has agreed to administer two temporary emergency support schemes. This scheme provides temporary emergency humanitarian support to small businesses that have been unable to secure flood insurance and have been flooded following storms in August 2017. At the request of the Government, the Irish Red Cross Society has agreed to administer the scheme. Closing date for receipt of applications is the 30th September 2017. This scheme is a temporary humanitarian support contribution towards the costs of returning business premises to their pre-flood condition including the replacement of flooring, fixtures, fittings and damaged stock. The scheme will not provide a contribution to loss of earnings or loss of business goodwill. 1. The first stage will commence immediately and will provide a contribution of up to €5,000, depending on the scale of damage incurred. 2. In the event that businesses have incurred significant damages above €5,000, the second stage will provide a means to seek further support. However, this will be a more lengthy process requiring a more detailed assessment. Eligibility Criteria for this scheme is detailed below. The total level of support available for both stages combined will be capped at €20,000 per property. (i) Only those small businesses that could not secure flood insurance are eligible. (ii) For the purpose of this scheme a small business will be defined as one with up to 20 employees. (iii) The business premises must have been flooded in August 2017 and this fact verified by the relevant Local Authority. 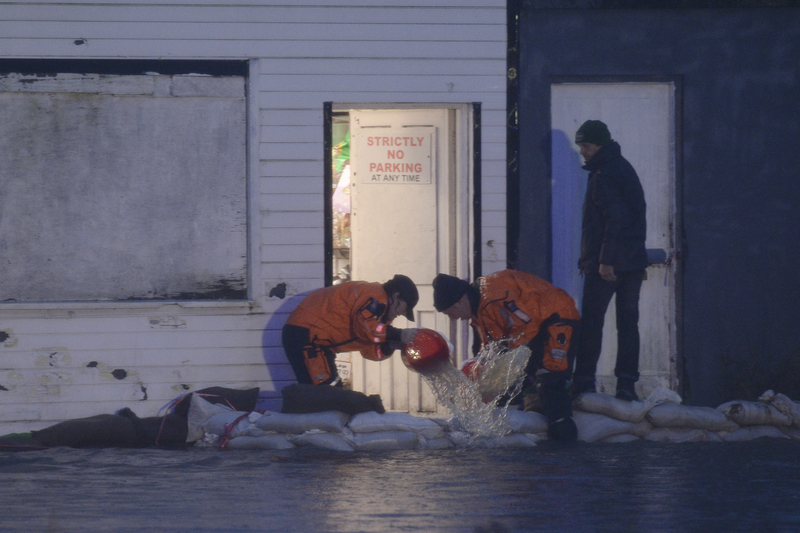 (iv) Any location within County Donegal flooded during the period in question is encompassed by the scheme. (v) At the time of the flood, the business must have been trading and in a rateable premises. (where the premises is not subject to commercial rates, the applicant should supply a tax clearance certificate as supporting documentation, or where this is not available, a recent official document from Revenue showing the tax registration number of the business). (vi) A business operating from a place of residence which suffered damage and was uninsured maybe eligible to claim from the scheme provided that specific documentation can be supplied and Department of Social Protection Scheme has not been used to co-fund. The Irish Red Cross is administrating this Government scheme to provide temporary emergency humanitarian support to Community, Voluntary & Sporting bodies affected by flooding in August 2017 in County Donegal. The closing date for applications is 30th September 2017. This scheme is a temporary humanitarian support contribution to cover flood damage to buildings, contents or fixture & fittings following storms in August 2017. This scheme will not provide a contribution to loss of earnings or loss of business goodwill or for damage caused to fairways or sports grounds or pitches. Eligibility criteria for this scheme are detailed below. 1. The first stage is intended to provide an immediate contribution of up to €5,000, depending on the scale of damage incurred. 2. In the event that an organisation’s premises, its content or equipment have incurred significant damages above €5,000, the second stage will provide a means to seek further support. However, this will be a more detailed assessment. The total level of support available will be capped at €20,000 (per premises). Email us at emergencyflooding2017@redcross.ie or call us 01 6424600 for more details. (i) The community, voluntary or sporting body must have been operating/trading in August 2017. (ii) The premises must have been flooded in August 2017 and factually verified by the relevant Local Authority. (iii) Only those organisations that could not secure flood insurance are eligible. (iv) Scheme applies to buildings, contents, fixtures and fittings. The Department of Social Protection is administrating a Humanitarian Assistance Scheme for households. This income-tested scheme provides emergency financial assistance to households who are not able to meet costs for essential needs immediately following flooding. The scheme aims to provide financial support to people who have suffered damage to their home. It is designed to alleviate hardship rather than provide full compensation for damage. The Irish Red Cross respects your privacy, any personal information that you volunteer will be treated in confidence, applying reasonable standards of security, in accordance with the Data Protection Acts, 1988, and 2003. The information provided will be retained by the Irish Red Cross for the purpose of administering the Government’s emergency humanitarian support for small businesses and community, voluntary and sporting organisations affected by flooding in August 2017. We may keep your data for a reasonable period after the cessation of the scheme but we will not keep it for any longer than is necessary and/or required by law. • your insurance company in respect of details of your existing policy. premises was flooded in the period specified. The bank details supplied will not be shared with any third party and will only be used for the purpose of processing any payment due in respect of your application for flood relief assistance. You have the right to request a copy of your personal data held by the Irish Red Cross. The information you provide will not be shared with any third party for marketing purposes nor will the Irish Red Cross make direct contact with you for any purpose not relating to your application under this scheme. Please contact the Irish Red Cross if any of your details change between the time you make your application and receipt of payment under this scheme.